Seahawks mailbag: Who will start on the defensive line? What happens to Chris Carson? And more! Plus the Seahawks' outlook on Kam Chancellor and a look at which rookies could be in line for starting roles. Beat writer Bob Condotta answers your questions in his latest mailbag. Time for yet another edition of the increasingly popular (that’s what “they” tell me, anyway) Seahawks mailbag!!! Front four? Who Is gonna start? A: A great question, especially given all the turnover on the defensive line this offseason, that I think may actually have a pretty easy answer. 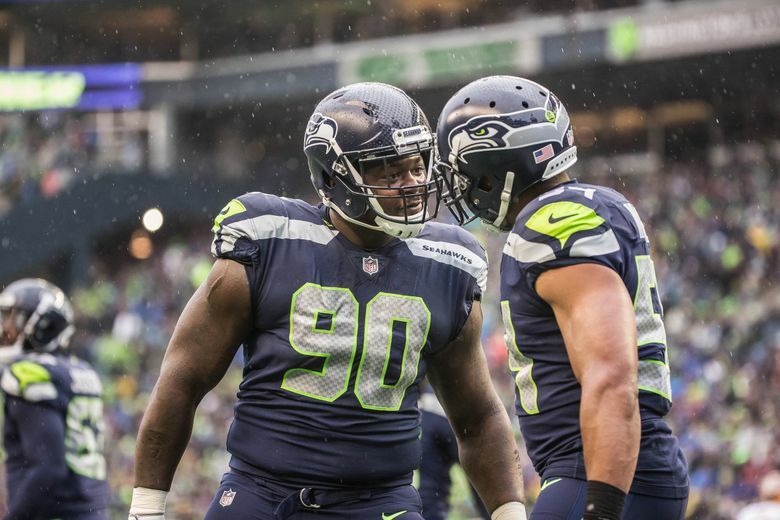 At the two tackle spots, I think the front-runners are Jarran Reed at nose and Tom Johnson at three-technique (where Sheldon Richardson played last season), and at the ends the likely starters are Frank Clark (at Cliff Avril’s rush end spot, or officially the right side on the team’s depth chart) and Dion Jordan (at Michael Bennett’s left defensive end spot). Reed, now entering his third season, is a given — at the NFL league meetings in March coach Pete Carroll twice volunteered Reed’s name as a player he expects to take a significant leadership role this season on defense after the departure of a number of veterans. Johnson was signed in March as a free agent after spending the last four years with the Vikings and the team has indicated it views him as a likely starter there with second-year player Nazair Jones rotating in and also playing quite a bit, but for now appearing to favor the veteran Johnson as the starter. Shamar Stephen, another former Viking also signed as a free agent in March, projects as Reed’s backup and a rotational player. We haven’t seen Jordan (nursing an injury) and Clark (sitting out) during OTAs, which on Monday had Branden Jackson and Marcus Smith most often appearing to work as the starting ends. Rookie Rasheem Green is also going to be a factor at end and free agent signee Barkevious Mingo is also going to get lots of work as an end in pass-rush situations. But barring injuries or something strange happening, Jordan and Clark look like the front-runners at end. What happens to Cris Carson, a guy that Pete Carroll was enamored with last season, now that Pete Carroll seems to be enamored with his new 1st round RB? A: Nothing other than getting on the field quite a bit. The team is undoubtedly enamored with Penny (though isn’t every team pretty excited about its first-round pick this time of year?) but that doesn’t mean that Carson will be mothballed. In fact, Carson has been one of the standouts of OTAs, with all the usual caveats about OTAs applying — there are no pads, no contact, etc — which always make it hard to judge a ton about the running game. But the biggest thing is that Carson is healthy and has appeared full-go and participated fully in everything. And health is the only real question about Carson — he’s had a series of ailments that have caused him to miss games every season since high school and given the way the team’s running back spot got hit by injuries last season, Seattle had no real choice but to beef up the depth there. But drafting Penny was not at all a comment on Carson’s ability, and if he’s healthy he’ll get plenty of work this season. Recall also that one of the attractions of Penny is his receiving ability. Penny could easily get work as the third-down/receiving back as well (as Carson did a few times last season) and the team could also find ways to get both on the field in some situations. After last season, if Seattle runs into a logjam for playing time at tailback, they’ll gladly take it. When should we learn more about Kam? Do you think he will be playing this season? A: The team has said Chancellor will have some more scans “in June.” I did not hear an exact date but Chancellor’s status is something we’ll ask about over the next week or so as Seattle holds its last workouts before breaking for the summer. As for whether he will play this year, that all depends on what the doctors advise — if he doesn’t get cleared to play, then there’s no decision for Chancellor to make, it will have been made for him. The team, though, doesn’t appear to be counting on him playing judging by the moves it made at safety in the offseason, making an aggressive move to re-sign Bradley McDougald — who replaced Chancellor last year when he got hurt — in March and then also signing former Rams’ starting safety Maurice Alexander as well as already having 2017 draftee Delano Hill in the fold. At this point, I think the team is expecting to not have Chancellor and if he then is cleared and decides to play again, all the better. A: None have, from what I can tell. I guess technically Michael Dickson has — he’s been the primary holder, a role that typically falls to the punter, and it’d be a surprise if he doesn’t end up as the starting punter this season. Penny gets lots of reps at tailback and it’s sort of semantics at that position — as Carroll says, someone has to take the first snap but from there anything could happen. My hunch is Carson and Penny will be the two main guys at tailback this year with others forging complementary roles (C.J. Prosise as primarily a third-down back, etc.). Green will be in the rotation on the defensive line but I haven’t seen him working a lot with the starters yet (he also appeared limited due to a knee issue during some of the open OTA time). Will Dissly also seems primed to get on the field quite a bit but Ed Dickson has usually been the starter at tight end. Shaquem Griffin is a solid number two behind K.J. Wright at weakside linebacker. Tre Flowers is making the transition to cornerback and it’s too early to tell yet what his ultimate role will be. Jacob Martin has worked with the backups at rush end and Jamarco Jones has been working as a backup tackle. Alex McGough will compete for Austin Davis for the backup QB job. If I had to guess, Dickson might emerge as the only listed starter at a position this year. But Penny, Green and Dissly could also see lots of time in rotational roles and Griffin will for sure be a factor on special teams, as could Flowers.